Hi everybody, here are some updates. I'm co-leading two Conscious Coach trainings in October. Conscious Contracts trainings are transformative for both the individuals and the company or law practice. As you align your values and practices, you'll find that clear integrity answers a lot of questions for you. You'll also experience more ease and opportunities for collaborations. In Las Vegas, Linda Alvarez, Glenn Meier, and I will be leading Conscious Contracts for Conscious Businesses on October 11 and 12. Sponsored by Nevada State Bank, this will be two full days of conscious business and contracts training. Open to both leaders in business and lawyers, the training includes hands-on practice and coaching. EARLY REGISTRATION DISCOUNT ENDS AUGUST 31. California has approved 12.5 credits of MCLE. The Las Vegas training materials include a copy of Linda's new ABA book, Discovering Agreement: Contracts that Turn Conflict into Creativity. In the Netherlands, Dialogue BV will once again host me and Digna de Bruin in presenting Sustainable Contracting, a Masterclass in Conscious Contracts. Conscious Contracts are catching on in the NL and Digna is working with some prominent values-focused companies! In addition to the basic training, she'll share about her progress in that area. Linda and I are creating a Conscious Contracts Certification program for lawyers and both of these programs will count toward the basic training required for that program. I've stopped predicting when the book will be out. The status is: in production. Edits are finished. Production staff is now composing the pages. The manuscript's table of contents shows that it is over 800 pages, so I guess it makes sense that it is taking so long. When I get a realistic date of release, I will let you know! I've been working with a web developer on the new Cutting Edge Law site. It is a few weeks from launch, I hope. (These things tend to take longer than predicted.) The new site will have a directory and a whole academy of web-based and live courses. The old site will continue to be there, with all its content, just as a section of the new one. I'm excited about the new site and can't wait to show you! Some postings, like the Our Children's Trust have multiple opportunities, from giving money to heading up a local lawsuit for young people who want to sue to protect the environment on behalf of future generations. [They train you!] There is a Bertha Foundation fellowship in South Africa and a Mediators Beyond Borders webinar on mediation in Saudi Arabia. I even placed my own Help Wanted ad! As we populate the site, I hope to post it around social media where it will reach a lot of people. I'm still tweaking it for functionality so folks on this list can post a few opportunities to make sure everything works. Then we can go broader with it. Not only did I create a new coaching website, I completed with a client this week so I have an opening! I was so inspired about that last session with the client. We'd worked together for six months and we both saw miracles. She said that I'd helped her take her focus off the dysfunctional system and focus on what she has to contribute. She no longer fears that she is an impostor, she feels at home, with deep roots that nurture her. She feels that she has a more integrated professional identity. Our work helped her to not only look at what she does, but how she does it, and how she can be more intentional in staying true to her values while being a lawyer. She left our coaching relationship with a brilliant touchstone statement and a realistic and supportive strategic plan for what happens next in creating a workable, even enjoyable, life in law. Some of the next steps have already manifested and she's well on her way. I think she's a rock star. Pretty cool results, aren't they? Let me know if you want the slot that just opened up. My new coaching website gives you the details of how it works and different packages that are available. Congratulations to Linda Warren Seely! Linda Warren Seely is the new director of the ABA ADR section! Linda has been an active part of the integrative law movement for many years. She was at the first integrative law summit in Manitou Springs in 2011 and has been a leader of the Lawyers as Peacemakers/Lawyers as Problem-Solvers group which has hosted many cutting-edge programs in Memphis. The ABA announcement seems to go on forever with her accomplishments, but I know for a fact that those are the tip of a very large iceberg. I couldn't be prouder and more excited for Linda! I'm glad the ABA was smart enough to hire her. As my Facebook followers know, I'm still in Florida. My son became a father in January and I've been supporting him in the horror of a paternity action to establish his relationship with his son. That and some other legal matters have kept me on the family farm. I wrote about some of the experiences of being on the client side of the lawyer-client relationship on LinkedIn, here. I thought all this would surely be over by now, but alas, it seems neverending. I miss having some of your great skills nearby. As you can see above, in October I will be back to my nomadic ways. I'll be co-leading the CC workshops, plus I'll be speaking at the TedX in New York on October 15. After the Netherlands, I'm heading to Spain for the first time! I'm tentatively booked there for early November. Details will come later. I have a lot of plans for a book tour in 2017. Stay tuned. I harvested my first cantaloupe today. 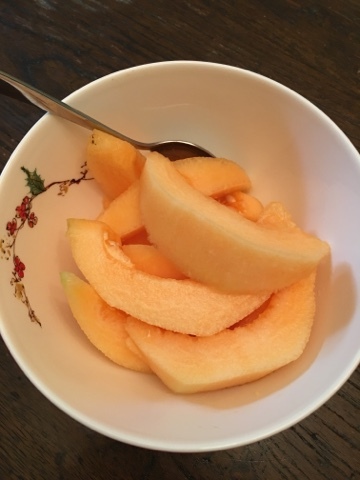 I ordered heirloom cantaloupe seeds from a specialty supplier. They promised a delicious, sweet, fragrant fruit of superior quality. I started the seedlings in a flat growing tray. I used sterile, fertile soil made that was formulated especially for starting seeds. I tended them carefully, making sure they got optimal sun during the day and were sheltered from cold weather at night. When the seedlings were well-established, I transferred them to a nice, sunny spot in the garden. I faithfully watered them every day. I fertilized them occasionally, too. I don't know why I was so surprised when the vines first grew pretty yellow flowers, and then I noticed little cantaloupes growing! I was so excited!